Make Your Own Gifts has more than 50 fantastic projects to make great handmade gifts that will be more memorable than their store-bought counterparts. From photo frames to handmade soap, this fun guide to arts and crafts includes awesome gift ideas for all occasions. Simple step-by-step instructions alongside detailed photographs make these gifts easy and accessible for children to make. With projects that range from fun trinkets made with materials found around the house to tasty baked treats made from scratch, this entertaining gift guide also includes instructions on how to make unique wrapping paper and gift tags to make any handmade present priceless. My daughter, Bridget, is a creative soul. She loves to draw and make crafts. She seems to have a real knack for it. I thought DK Canada’s Make Your Own Gifts would be right up her alley. Plus, the projects in the book will be fun for us to do together as I also like to do crafts. The apple doesn’t fall from the tree or so they say! Make Your Own Gifts features over 50 craft projects that are simple enough for kid’s to make on their own or with the help of a parent (if they are younger). You’ll find themed gifts for the holidays like Valentine’s day, Christmas, Mother’s day and Father’s day as well as gifts that can be used any time of year. Each project has lots of step-by-step pictures with easy directions so you can see what you are supposed to do at each stage. It also has a picture of what the final product looks like. You’ll also see a list of all the tools and supplies you’ll need. It’s divided up by the style of project including Paper Craft Projects, Stitched and Beaded Goodies, Molded and Sculpted Treasures, Make, Bake and Create Treats and Beautifully Wrapped Projects. There’s even a few projects in there that I’d like to do on my own. I’m looking forward to tackling a couple from the list above over the next few months. I just need to hit up Michaels and pick up some craft supplies. Do you ever make your own gifts? Connect with DK Canada on Facebook & Twitter. Also find it on Amazon.ca. Sounds a good book to have specially to encourage children to do stuff. I’ve always liked to make personalized craft gifts for friends, this is great! I have to be honest, I have never made my own gifts, not since elementary school. 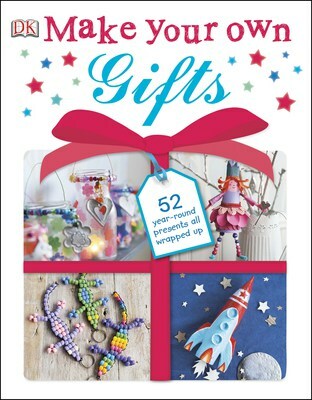 This looks like a great book about crafts and they look like a lot of fun. Thank you for sharing this review. When you decide what crafts your going to do come back and let us know how they went. This would be a great book for our Make-It and Take-It Club! What great and creative ideas! Kids can be so creative and this would be wonderful to keep them entertained, work on skills, plus great for gifts. Relatives love getting personalized gifts. Even many adults enjoy doing their own crafts so I can definitely see the need for this book. When the grandchildren come over for a visit we always do crafts. this book looks like it has a few fresh ideas. I love making and receiving handmade gifts. This book sounds like it has some great ideas. I am always looking for new handmade ideas for gifts and ornaments to use instead of bows on wrap. Thanks for this review! I definitely want this book. So many great ideas, things to make. And I think my little girl will be a crafter for sure! Yes I have handmade a lot of presents for my family. It is fun. I make jewelry mostly and I like upcycled crafts, so paper beads, things made out of packaging, etc. Some of the crafts look complex. My daughter has made the beaded lizards before and they are decorating my suitcase. Ive got to buy the book im always looking for gifts to buy for my special needs clients ,I find it great ideas to make your own I love it. Looking forward to checking this book out for my daughter and I!! I think this book would be great for my daughter to make gifts (with a little help from me). Thanks for sharing! Sounds a good book to have! This book sounds like it has some awesome ideas. Yes; I have made sweaters, babies, children and adults. I have made mittens, hats, and hundreds of slippers. I really enjoy knitting and the recipients are usually very happy with the knitted goods. Thank you for sharing your review with us.